← The Sun Moves Into Sagittarius – Happy Birthday Sagittarius, It’s Your Time To Shine! 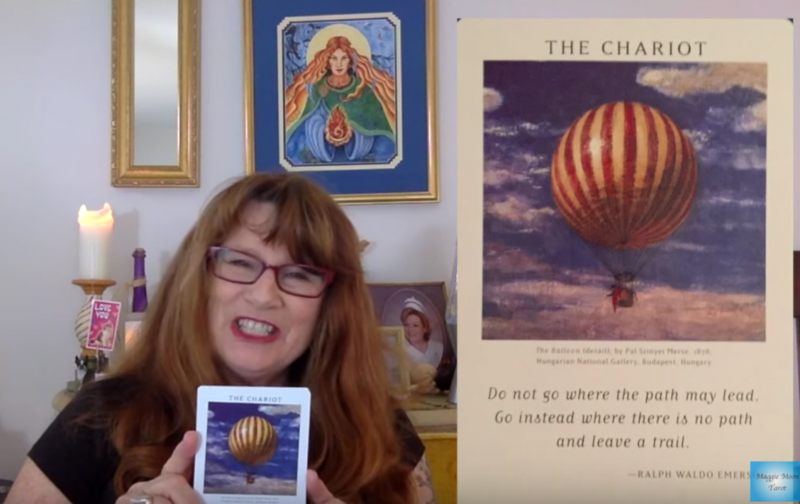 This week I’m reading utilizing the Creativity Spread from the Art of Life Tarot. Card 1 is Inspiration and asks us how we are inspired to do the best work possible. The Chariot, came out, from the painting The Balloon by Pál Szinyei Merse, in the Hungarian National Gallery. The quote on the card from Ralph Waldo Emerson, “Do not go where the path may lead. Go instead where there is no path and leave a trail.” The art and quote is a beautiful inspiration for this question. In doing our best work are many styles and approaches, and we each will find the one that works best for us. As the Balloon is moving across the blue sky amongst fluffy white clouds it inspires us to have the freedom to move forward without limitations, being free to experience unlimited possibilities. We may experience a few clouds along the way, we come out the other side with clarity and focus. The video for all the cards in the creativity spread and astrology for the week! This entry was posted in Astrology, Maggie Lukowski, Maggie Moon Tarot, Tarot and tagged Art, Art of Life Tarot, astrology, Creativity Spread, google.com/+Maggiemoontarot_Metaphysical_Consultant, http://maggiemoontarot.com, http://twitter.com/maggiemoontarot, http://www.facebook.com/maggie.lukowski, Hungarian National Gallery, Maggie Lukowski, Maggie Moon Tarot, Tarot, The Balloon. Bookmark the permalink.